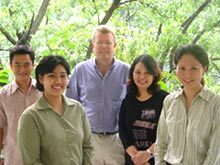 Two new colleagues joined the staff of the Friedrich Naumann Foundation’s Philippine office. Ms. Alexandra Cuyegkeng is our new communications officer and is in charge of communicating the liberal Foundation’s message to various target groups in the country. Ms. Cuyegkeng has a bachelor’s degree in English literature from the Ateneo de Manila University. She also recently received her master’s degree in public relations from Boston University in the United States. Also joining our team is Ms. Clare Cattleya Amador in the position of executive assistant. Ms. Amador received her bachelor’s degree in development studies also at the Ateneo de Manila University and — considering her young age — has an impressive track record in advocacy work in the fields of education, youth empowerment, and environmental conservation. “I am looking forward to working together with these highly qualified and very motivated new colleagues,” said Dr. Ronald Meinardus, the Foundation’s resident representative.